Chris thought he was solely meeting Olesya to discuss a medical situation, as a favor to two beautiful friends. And the moment Chris laid eyes on Olesya, the last thing on his mind was medical advice! On a beautiful, crisp and sunny Winter day, Chris married the love of his life, in an intimate and elegant ceremony at Port Ludlow Resort, surrounded by loving friends and family and Olesya’s wonderful son. There is something sweet and magical about a couple coming together at mid-life. A wedding ceremony for two loving people in their 40’s, 50’s or 60’s often has a different feel because there is more history and life experience to such a lifetime moment and often includes or child or children. For Chris and Olesya, they artfully crafted and hosted a wedding day that was truly about the two of them and their son and one that held kind and gracious touches for their delighted guests. This wedding celebration had two sets of live musicians, gratitude to family and friends, a ceremony ritual that included the young man of this relationship, a beautiful meal, rituals to celebrate the joy of a new family and more. It was such happiness for me to join Chris and Olesya for their big day…simply lovely. Annemarie, It was a pleasure working with you again. I agree that this was a perfect wedding with the most adorable couple. 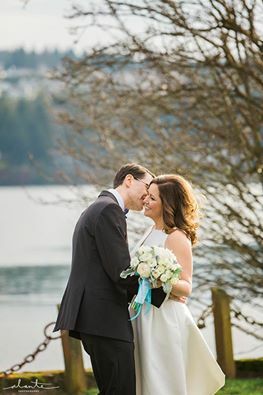 Chris and Olesya were wonderful to work with in planning their wedding here at The Resort at Port Ludlow with their son Artemiy. Their wedding of 30 guests was the perfect size for us and everyone enjoyed the celebration. Thank you for being a part of this memorable day.